This was not the post I had intended for today. But I need to talk about overcoming humiliation so you’ll all have to be my guinea pigs. I had a really horrible day at the range yesterday. First, my Kel Tec Sub-2000 started light striking again on the second shot after I had just picked it up from the gunsmith. According to the fantastic smith we use, it was running great. Trouble is, it wouldn’t shoot two rounds in a row for me. Our gunsmith is incredible so I have no idea what is going on. All I know is the beeper does its thing to announce the start of my run, I book it at high speed to my rifle, shoulder it, pull the trigger, and hear a click. I rack out a round, pull the trigger and “BANG!” Relieved, I pull it again. Click. Lather, rinse, repeat. Only add in my starting to mutter “please God no. No no no no no!” as the clicks are far more frequent than the bangs. A bit later, because the people who run our matches are awesome, they let me reshoot and I picked up Mr. SIL’s AR, a Daniel Defense DDM4 V5 LW, similar to these (they don’t make our exact model any more). This is a rifle I adore but I am not super familiar with it and have certainly never used it in a stressful competition situation. I endeavored to use it for the remainder of the match. But my troubles had only just begun. We shot with a highly skilled group. I was incredibly intimidated immediately but I usually don’t let this get me down and instead try and rise to the occasion and learn from those who are better than me. Rising to the occasion did not occur, however, as I made one stupid mistake after another. The RO’s had to remind me more than once to engage my safety. My shooting wasn’t crisp and I found myself doing things I NEVER do, like gripping my pistol poorly. It felt like I looked as though I had never shot a gun before. In my eyes, and — I fear — to anyone looking, I must have seemed like the world’s biggest time wasting idiot. Honestly, I almost missed my turn for a stage because it was so humid I had trouble getting my pants up in the ever present Port-a-Potties at the range. I came out just as I was to go up and I wasn’t ready. They had to let the next guy go ahead of me, making me feel even more incompetent. At least this didn’t happen? I am so embarrassed. Here I am, a woman who loves shooting enough that I write this blog about it. I’m someone who is always encouraging people to get out and compete, to spend more time at the range, be bold and tough. Yet I found myself standing at a range, feeling exposed and silly in my bold brown lipstick. Despite my carefully chosen gear, I was clearly just posing as a shooter. I was sure that, over dinner tonight, the competent 3 gunners would be shaking their heads at the silly and stupid girl who clearly has no clue. Even now, as I write this, I feel my eyes filling with tears of humiliation. For heaven’s sake, after one brutal run in which I timed out after one gun of three while my dear friends who came over to say hello watched, I had to walk away and cry. Guys, I even caused Mr. SiL to cut his finger open on my shotgun’s extractor because I was too nervous to fix a minor issue and he had to bail me out. I wanted to throw all of my guns in the garbage, shutter this blog, and never even look at a gun for the rest of my life. It suddenly became unfathomable to contemplate shooting with these people again. Thinking of everyone I imagined I had let down, I placed the entire world of women’s shooting sports squarely onto my shoulders. It wasn’t that I was having a bad day. I sucked, and that reflected on every woman to ever pick up a gun. 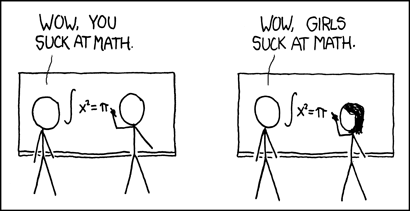 I can’t be the only women who reacts this way to things… XKCD says I am not. I hotly told him I had embarrassed us both and would not be doing it to us again. To his credit, he said nothing. It seemed abundantly clear the smartest thing to do was to retire from the shooting sports. But I know I won’t. This is despite the fact I’m still fairly convinced this is much like that time I agreed to play World of Warcraft. I was horrible. Because Mr. SiL is not, people were nice to me. But I knew there were toddlers who could play better than me. A very honest friend summed it up nicely by telling me my virtual corpse did a lovely job of decorating the floor after losing during a group fight. (thanks Grace). The problem with quitting is that I love shooting. And while there may only be a few of you reading this for now, I’d be letting us all down if I turned in all of my guns for a backpack of school supplies. I won’t do that to us. So, If You Aren’t Going to Quit, Erin, What ARE You Going to Do? I’m a planner, a list maker, and a checker offer so I thought I would make a plan for getting past this embarrassing situation. Please hold me accountable. Move to another state where nobody knows me. I hear Arkansas is nice this time of year. Dye my hair and change my name. I thought this was a good one but Mr. SiL said no. Call a cease fire to the self flagellation. After an appropriate amount of time (a day or two tops) make an action plan for practice and improving. Contact appropriate people about the issues with my Kel Tec. Stop listening to the voice telling you it’s the operator and not the equipment. Yeah I had a day that sucked. I’m still embarrassed. But I am reminded that the match leader said to me yesterday (I’m paraphrasing) “you had some equipment issues but nobody made fun of you. Or your lipstick.” He’s right. Maybe they don’t think I’m a moron after all. How do you handle overcoming humiliation?